A jaboticaba tree in full bloom is a beautiful example of 'cauliflory' which means the flowers of the tree appear on the main trunk or branches of the tree instead of in the leaves. The fruit matures from these flowers so they end up clinging to the trunk and branches rather than hanging. This gives the tree a unique appearance, at least to those outside of Brazil. These trees are grown in the interior of a region because they don't do well in salty soil and air conditions, such as by the ocean. The fruit's skin is tough and will prevent bruising if shipped carefully, but the fruit has a very limited shelf life and will start to ferment quickly once harvested. This is another reason we don't see jaboticaba fruit often outside of its native region. The tree has salmon-colored leaves when young, then turning green as the tree gets older. These are very slow growing trees which prefer moist acidic soils. When the tree is tended and irrigated routinely, it will produce fruit year round. Even though jaboticaba species are subtropical, they can tolerate mild, brief frosts. Cultivation of the fruit in the Northern Hemisphere isn't so much hampered by temperature and climate as it is by the tree's very slow growth and the short shelf-life of the fruit, making it commercially undesirable. Seed grown trees may take up to 20 years to bear fruit, making this tree not very popular as an orchard tree but very popular for bonsai and ornamental container planting. 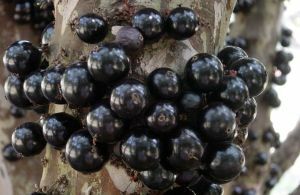 Taste-The fruit Jaboticaba's appearance invited Trubus to taste those ripe fruits. Rosy Nur Apriyanti, Trubus reporter, picked up from the fruits. 'It tastes sweet,' as the grape like fruit flesh with soft texture was enjoyed by the tongue. "On the first day of the fruit picked, its flavour is like guava, and the second day it is like mangosteen, and the third day is lychee taste, the forth is passion fruit taste, the fifth is sweetsop fruit; the sixth up to the eighth is grape fruit nature of taste." The best flavor impression is on the ninth day when fruit becomes perfectly ripe and it tastes sweet and smells good. One of the most interesting facts about the Jaboticaba is the way the flowers and fruit grow. As we mentioned, instead of the flowers and fruit blossoming and growing in the leaves, they actually sprout and cling to the tree's trunk and larger branches. This gives the tree a funny look when it has fruit; sort of like someone stuck big grapes all over it. Jaboticaba fruit has a very short shelf life, making it pretty much unknown in parts of the world which this plant is not grown. The fruit starts to ferment within days after harvested, which actually makes the production of wines and liqueurs a favorite use. If you are lucky enough to have a jaboticaba tree in your backyard, you can use the fresh fruit to make jelly or marmalade, again removing at least some of the skin before you do to avoid the tannins. The skins should also be removed if you make any sort of beverage with the fruit. Other than these uses, if you have fresh jaboticaba fruit available, go ahead and peel it, take out the seeds and mix up a fruit salad, make sherbet, or bake a cobbler. The treatment for hemoptysis, asthma, diarrhea and dysentery also as a gargle for chronic inflammation of the tonsils are by the caustic decoction of the sun-dry skins is agreed in Brazil. Such use of fruit also may lead to excessive consumption of tannin. The fruit of Jaboticaba contain compounds similar to known to have positive biological effects in cranberries, grapes and other related species, including anti-ageing, anti-inflammatory and the antioxidant qualities. Recipe using Jabuticaba see Here and Here.